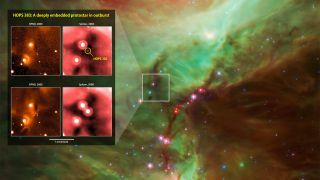 Infrared images from instruments at the Kitt Peak National Observatory and NASA's Spitzer Space Telescope document the outburst of a young protostar in Orion. A young star in the earliest phase of its life has erupted after gobbling up gas and dust, and appears to be the earliest such burst ever recorded. The eruption was first recognized in 2014, when astronomer Emily Safron, who had just graduated from the University of Toledo in Ohio with her bachelor’s degree, noticed an object in her data that was brightening dramatically over time. Stars are born within the clouds of dust and gas scattered throughout most galaxies. Turbulence within the clouds gives rise to knots that begin to collapse under their own weight. The knot quickly becomes a protostar, and continues to grow denser and hotter. Eventually, the central protostar becomes surrounded by a dusty disk roughly equal to it in mass. Astronomers call this a "Class 0" protostar. Although a Class 0 protostar has yet to generate energy by fusing hydrogen into helium deep in its core, it still shines, albeit faintly. As the protostar collapses further and accumulates more material from the disk of gas and dust surrounding it, it releases energy in the form of visible light. But this light is often blocked by the surrounding gas and dust. Studies have shown, however, that the light heats up the dust around the protostar, causing it to give off a faint glow that can then be detected by infrared observatories, like the Spitzer Space Telescope. In this way, astronomers can detect a protostar's presence via the faint glow of its surrounding dust clouds. But in 2006, a Class 0 protostar in the constellation Orion, dubbed HOPS 383, acted out of the norm and brightened dramatically. Over two years, it became 35 times brighter. In addition, the most recent data available, from 2012, show that the eruption isn't fading. "HOPS 383 is the first outburst we've ever seen from a Class 0 object, and it appears to be the youngest protostellar eruption ever recorded," William Fischer, a postdoctoral researcher at NASA's Goddard Space Flight Center in Greenbelt, Maryland, said in a statement from NASA. The new study of HOPS 383 was completed using data from the Spitzer telescope in conjunction with the European Space Agency's Herschel Space Observatory, as part of a project called the Herschel Orion Protostar Survey (HOPS). Scientists were also surprised by the length of the eruption, thus making HOPS 383 even more intriguing. "An outburst lasting this long rules out many possibilities, and we think HOPS 383 is best explained by a sudden increase in the amount of gas the protostar is accreting from the disk around it," Fischer said. Such episodes have been observed in older protostars and have been theorized to occur in younger protostars. These episodes could help explain why protostars are dimmer than scientists think they should be, according to the study. To build up the bulk of a typical star over a short time period, protostars should be brighter, as they should accumulate more material from the surrounding disk faster. Because these protostars are so faint, some astronomers suspect that they could also build up the bulk of a typical star by randomly munching on a lot of material from the surrounding disk, as noted in the study. If that were the case, then astronomers should regularly observe these flashes. The team will continue to monitor HOPS 383 and has submitted a proposal to use NASA's Stratospheric Observatory for Infrared Astronomy (SOFIA), the world's largest flying telescope. The study was published in the Feb. 10 edition of the Astrophysical Journal and is available online. Follow Shannon Hall on Twitter @ShannonWHall. Follow us @Spacedotcom, Facebook and Google+. Original article on Space.com.